You can find the full article in the original german version here. Translation bellow. Ergon Guitars is the brand of Portuguese professional bass player Adriano Sérgio, who says that in the late 90s he started spending increasingly more time repairing instruments than playing them. His skills earned him a vast number of gigs as international guitar technician for touring musicians, until this lifestyle became too exhausting, and he opened his own ‘Guitar Rehab’ workshop in Lisbon in 2005, where his Ergon Guitars are now crafted. Sergio’s proclaimed aim for himself and his crew of three is not to please just anyone’s taste, but to tread his new idiosyncratic path. What the team loves the most is making guitars tailored to their owner. 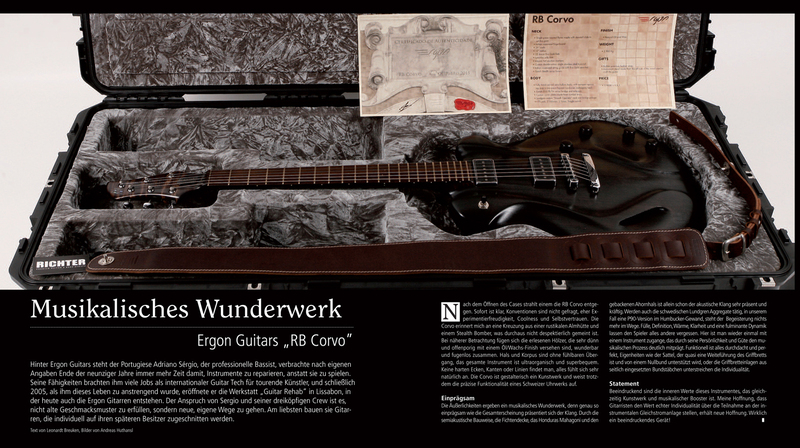 After opening the guitar case, we are faced with a stunning RB Corvo. It’s patent from the onset that conventions are being defied here in favour of an eargerness to experiment, to impress and of self-confidence. The Corvo reminds me of a cross between a mountain cottage and a stealth bomber, and no lack of respect is meant here at all. On closer inspection, the exquisite choice of woods with its thin open-pore oil-wax finish, comes together absolutely jointlessly in a miraculous manner. There is no tactile transition betwwen neck and body, the whole instrument has a hyper organic and super comfortable feel to it. There are simply no rough edges or rims, everything feels completely natural. While being a masterpiece of design, the Corvo also encloses the functional precision of a Swiss clockwork. Not only its exterior creates a musical marvel – its sound more than matches its outer design. Its semi-acoustic design alone combined with the spruce top, the Honduras mahogany body and the roasted maple neck assure an impressively present acoustic sound. Add to this Lundgren Pickups from Sweden, here with P90 humbuckers, then nothing stands in the way of utter impressiveness. The guitar’s full-bodiedness, precision, warmth, clarity and amazing dynamics draw the performer in like nothing else. It’s proof that there are instruments that can help shape the musical process thanks to its strong character and high quality. Nothing has been left to chance in terms of functionality and comfort, and idiosyncracies like the nut that is basically an extension of the fretboard helped by a zero fret, or the fretboard inlays placed sideways add to create an absolutely unique guitar. The interior workings of this instrument are truly impressive, adding to the guitar as a piece of art and augmenting its stunning musical potential. My hope that guitarists will measure true individuality by taking part in the construction process has gained new hope. A truly remarkable instrument!